HUGGIES Natural Care Baby Wipes in Refill Packs are softer for sensitive skin and help you care for your baby's delicate skin from the very start. These hypoallergenic baby wipes are dermatologically tested, and ideal for newborn skin. Fragrance free, alcohol free and parabens free, you can trust that you're giving your baby a gentle clean each and every time. 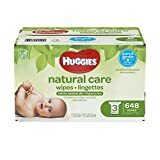 HUGGIES Natural Care Refill Packs and cases are a great way to replenish your HUGGIES Pop-Up Tubs and to make sure you always have a wipe on hand. Choose the right pack for your family, and the right style for you: HUGGIES Natural Care Wipes disposable soft pack, reusable Pop-Up Tub, Refill Pack, and the stylish Clutch 'N' Clean dispenser. Ingredients - water, butoxy peg-4 pg-amodimethicone, coco-glucoside, aloe barbadensis leaf juice, caprylyl glycol, malic acid, sodium benzoate, sodium citrate, tocopheryl acetate.